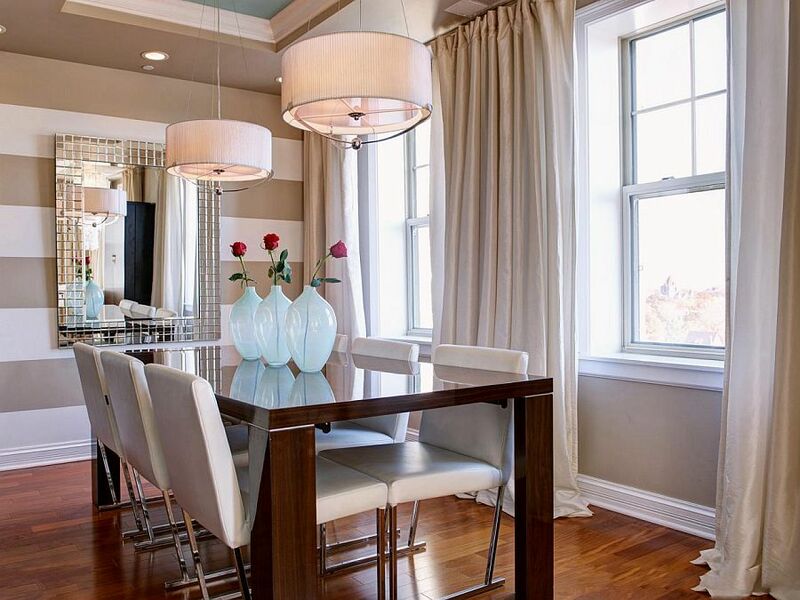 There is no doubt that the idea of an exclusive and dedicated dining room is becoming more and more rare with the popularity of open floor plans. Add to this the desire of homeowners to use the available space in a more versatile and practical fashion, and it seems the traditional dining room could soon be a thing of the past. Yet whether you prefer the more open dining space integrated with the rest of the living area or the separate dining room, there is no doubt that a beautiful accent wall helps heighten the aesthetics of the space. 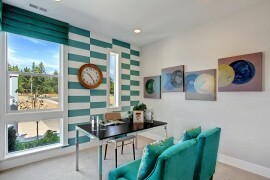 And what better way to shape these sensational accent walls than with some spirited stripes? 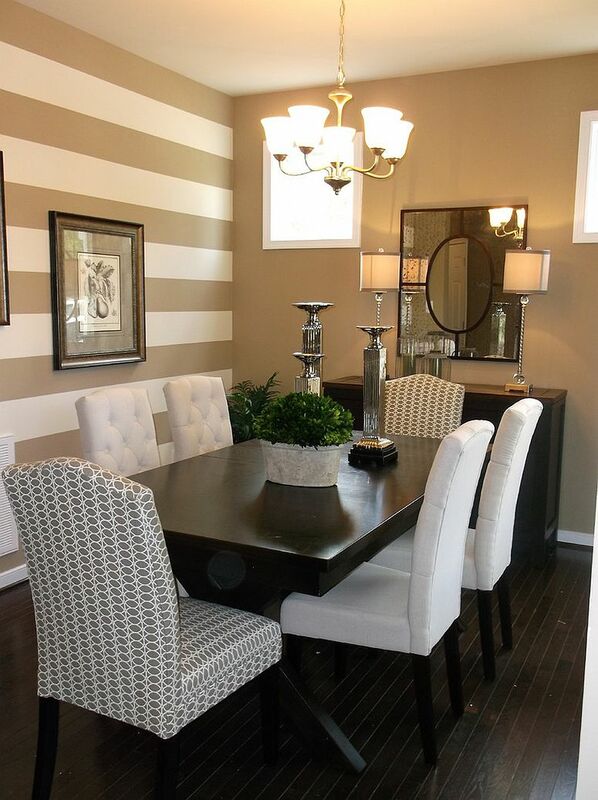 Striped accent walls need not be relegated to the living room or the bedroom alone, and as the inspirations on display today showcase, they indeed make a gorgeous and bold visual statement! They definitely add a lot more pattern than an accent wall in a solid color and also bring along with them a hint of playfulness. It is time to paint by stripes! 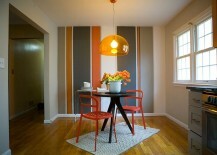 We start off with a dining room accent wall that uses stripes in an unusual and fun fashion. 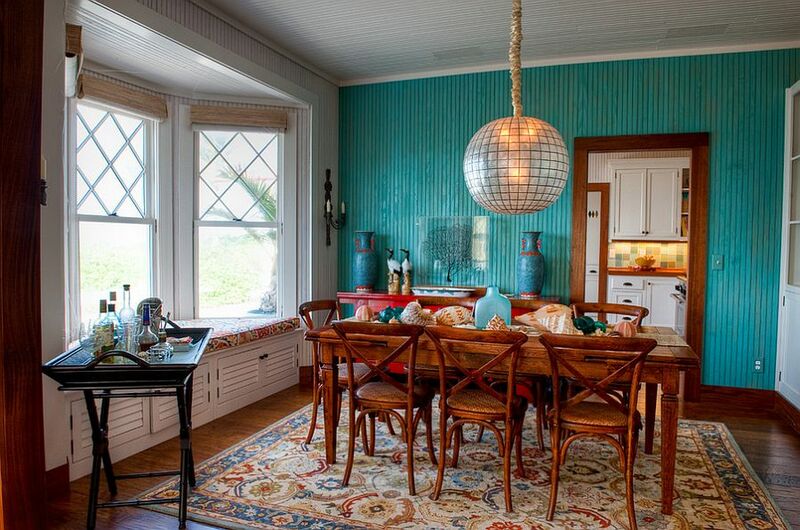 These are not the usual simple straight lines, and the flashy pattern instantly turns a very normal dining space into an eye-catching beauty. 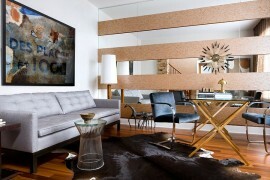 The accent wall here seems to also double as a work of abstract art, adding color and liveliness to the room. 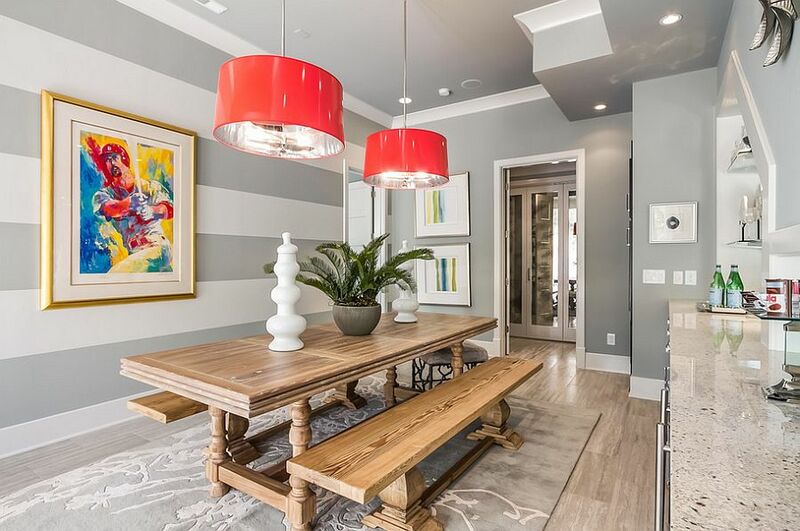 If the pattern above is all about contemporary and abstract flair, then the striped accent wall below showcases eclectic elegance at its glorious best. 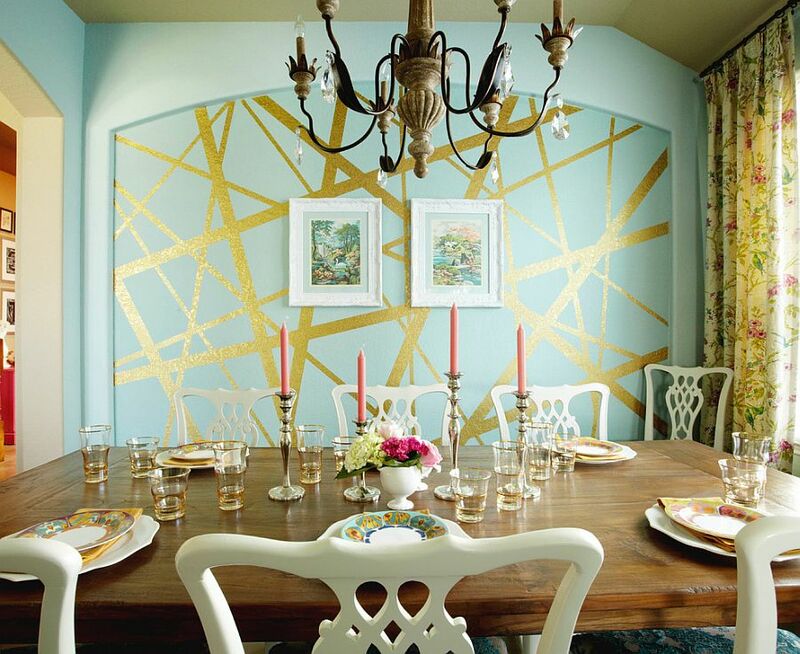 The seemingly erratic golden stripes on the wall draw your attention instantly and also add a touch of glitter to the dining room. 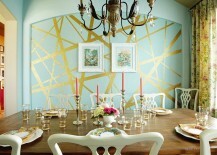 Creating a myriad of geometric patterns, the ingenious addition seems both trendy and dramatic. 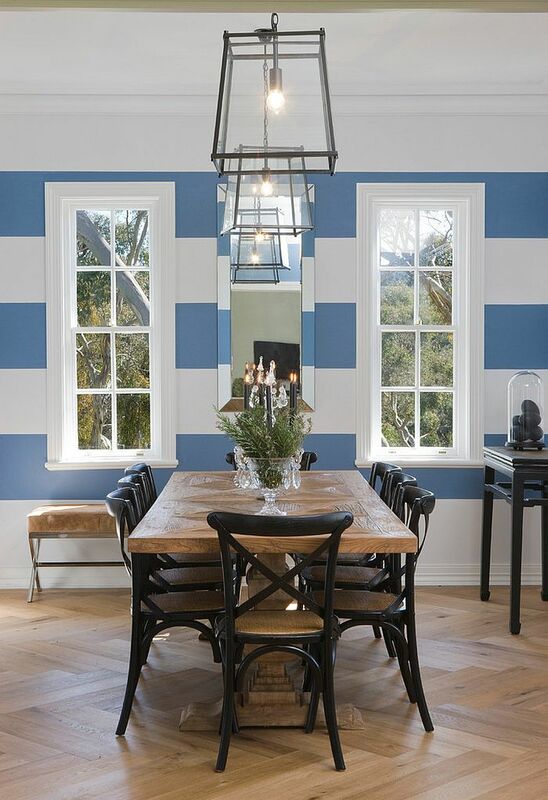 The stripes here might not be as daring in form as in the inspirations above, but they are equally captivating thanks to the use of fabulous color and simple symmetry. This is a perfect way of highlighting a small breakfast nook or dining space in an open floor plan without drastically altering the color palette or the theme of the area. 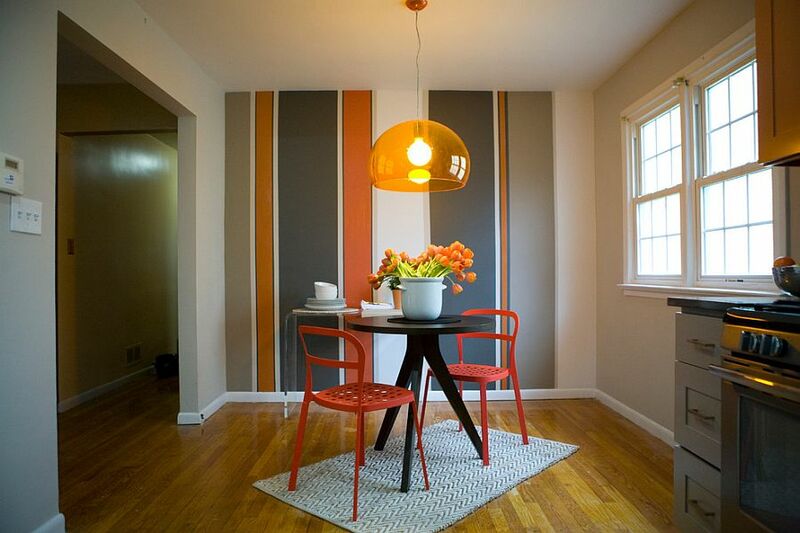 The repetition of orange in decor and lighting fixture gives the space a more curated look. 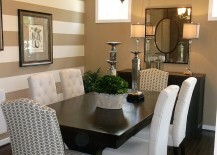 Stripes need not automatically mean paint, as there are other ways that you can create a similar visual effect with far more impact. 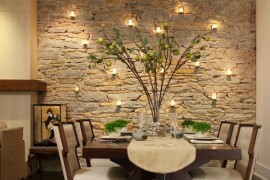 Wooden wall panels are ideal for those who wish to usher the warmth of wood into the contemporary dining room that is dominated by stone, concrete and glass. 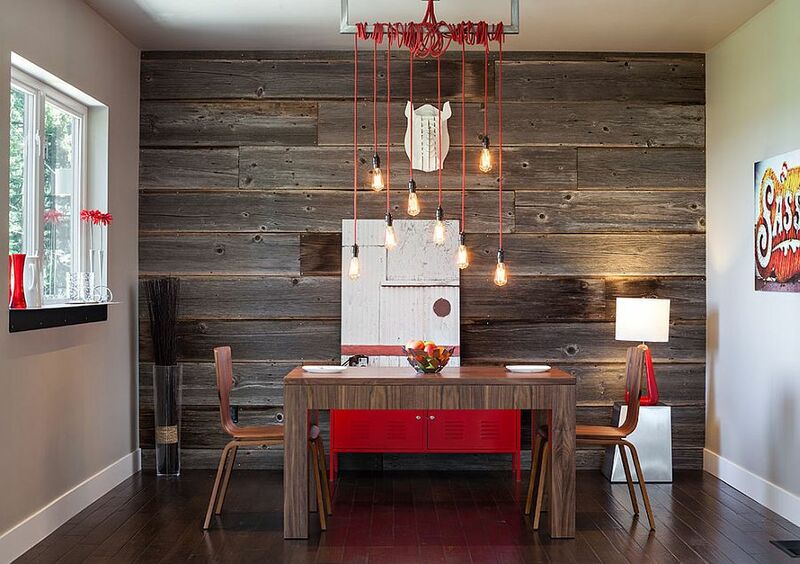 Lovely wooden panels (horizontal or vertical) will create textural and visual contrast with ease while leaving the color scheme of the room unaltered. 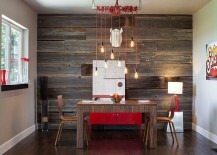 Using reclaimed wood for this task is both eco-friendly and inexpensive. Beadboard wall paneling and wallpaper also provide fun alternatives to those who do not wish to go down the natural wood route. 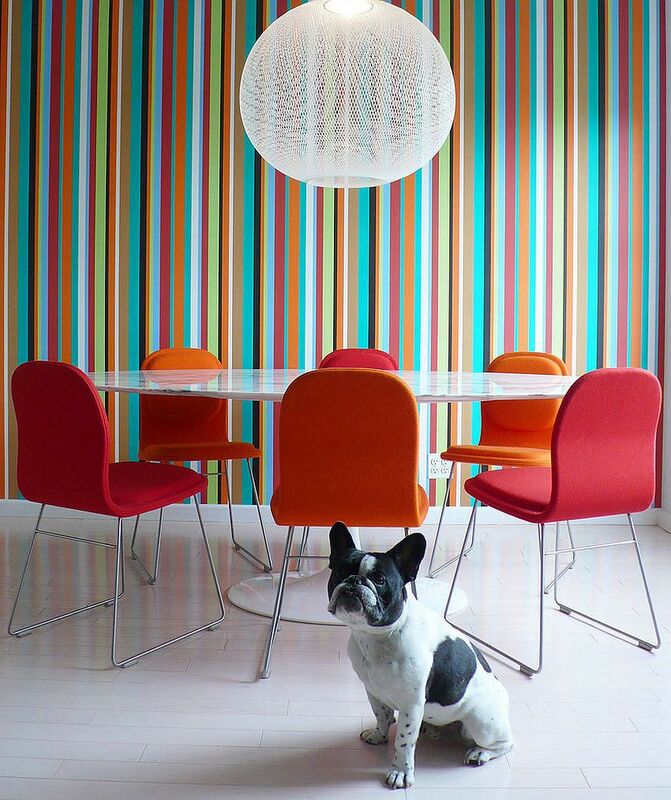 If you are more traditional with your stripes, there is always the classic horizontal stripe pattern that acts as a natural extension of the color palette already used for the walls. 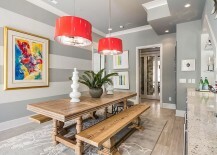 Broad stripes generally seem to be the preferred choice in most contemporary settings, and you can always pick the color already used for the other walls of the room as one of the colors for the stripes. 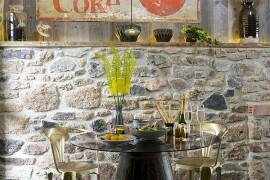 Play with tones, shades and intensity to get the look of your choice. 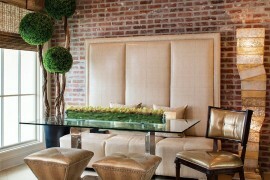 The approach is essentially simple yet stylish and almost always works with any theme that you have going.